^ S.J.S. Cookey (1980). "An Ethnohistorical Reconstruction of Traditional Igbo Society". In Swartz, B.K. ; Dumett, Raymond E. West African Culture Dynamics: Archaeological and Historical Perspectives. Mouton de Gruyter. p. 329. ISBN 978-90-279-7920-9. Retrieved 3 June 2016. ^ Isaac, Glynn (1982). "The Earliest Archaeological Traces". In Clark, J. Desmond. The Cambridge History of Africa. Volume. I: From the Earliest Times to C. 500 BC. Cambridge: Cambridge University Press. p. 246. ^ "Bose, China". What Does It Mean to be Human?. Smithsonian National Museum of Natural History. 2010-01-28. ^ Clark, J. Desmond (1982). "The Culture of the Middle Paleolithic/MIddle Stone Age". In Clark, J. Desmond. The Cambridge History of Africa. Volume. I: From the Earliest Times to C. 500 BC. Cambridge: Cambridge University Press. p. 248. Rogers, Michael J.; Semaw, Sileshi (2009). "From Nothing to Something: The Appearance and Context of the Earliest Archaeological Record". In Camps i Calbet, Marta; Chauhan, Parth R. Sourcebook of paleolithic transitions: methods, theories, and interpretations. New York: Springer. Shea, John J. (2010). "Stone Age Visiting Cards Revisited: a Strategic Perspective on the Lithic Technology of Early Hominin Dispersal". In Fleagle, John G.; Shea, John J.; Grine, Frederick E.; Boden, Andrea L.; Leakey, Richard E. Out of Africa I: the First Hominin Colonization of Eurasia. Dordrecht; Heidelberg; London; New York: Springer. pp. 47–64. A microlith is a small stone tool usually made of flint or chert and typically a centimetre or so in length and half a centimetre wide. 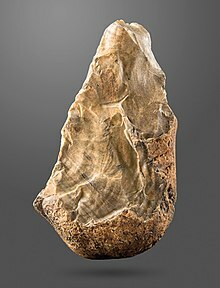 They were made by people from 35,000 years ago to about 3,000 years ago, in Europe, north Africa, across Asia and in Australia, and used in spear points and arrowheads. 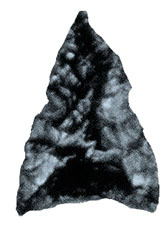 Microliths are produced either a small blade or a larger blade-like piece of flint by abrupt or truncated retouching. 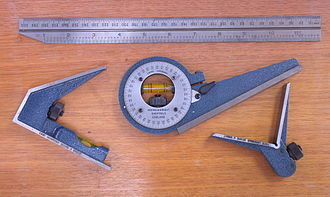 The microliths themselves are sufficiently worked so as to be distinguishable from workshop waste or accidents, two families of microliths are usually defined and geometric. An assemblage of microliths can be used to date an archeological site, laminar microliths are associated with the end of the Upper Paleolithic and the beginning of the Epipaleolithic era, geometric microliths are characteristic of the Mesolithic and the Neolithic. Geometric microliths may be triangular, trapezoid or lunate, microlith production generally declined following the introduction of agriculture but continued in cultures with a deeply rooted hunting tradition. 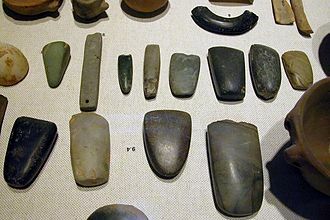 Regardless of type, microliths were used to form the points of hunting weapons, such as spears and arrows, and other artifacts and are found throughout Africa and Europe. 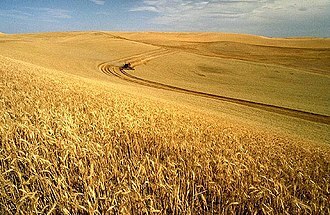 They were utilised with wood, bone and fiber to form a tool or weapon. An average of six and eighteen microliths may often have been used in one spear or harpoon. Laminar microliths date from at least the Gravettian culture or possibly the start of the Upper Paleolithic era, noilles Burins and Microgravettes indicate that the production of microliths had already started in the Gravettian culture. This style of flint working flourished during the Magdalenian period and persisted in numerous Epipaleolithic traditions all around the Mediterranean basin. These microliths are slightly larger than the geometric microliths that followed and were made from the flakes of flint obtained ad hoc from a nucleus or from a depleted nucleus of flint. They were produced either by percussion or by the application of a variable pressure, there are three basic types of laminar microlith. 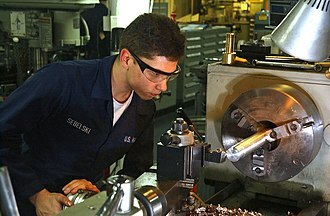 Metalworking is the process of working with metals to create individual parts, assemblies, or large-scale structures. The term covers a range of work from large ships and bridges to precise engine parts. It therefore includes a wide range of skills, processes. Metalworking is a science, hobby and trade and its historical roots span cultures and millennia. Metalworking has evolved from the discovery of smelting various ores, producing malleable and ductile metal useful for tools, modern metalworking processes, though diverse and specialized, can be categorized as forming, cutting, or joining processes. Todays machine shop includes a number of machine tools capable of creating a precise, the oldest archaeological evidence of copper mining and working was the discovery of a copper pendant in northern Iraq from 8,700 BCE. The earliest substantiated and dated evidence of metalworking in the Americas was the processing of copper in Wisconsin, Copper was hammered until brittle heated so it could be worked some more. This technology is dated to about 4000-5000 BCE, the oldest gold artifacts in the world come from the Bulgarian Varna Necropolis and date from 4450 BCE. Not all metal required fire to obtain it or work it, isaac Asimov speculated that gold was the first metal. His reasoning is that by its chemistry it is found in nature as nuggets of pure gold, in other words, gold, as rare as it is, is sometimes found in nature as the metal that it is. There are a few metals that sometimes occur natively. Almost all other metals are found in ores, a mineral-bearing rock, another feature of gold is that it is workable as it is found, meaning that no technology beyond a stone hammer and anvil to work the metal is needed. This is a result of properties of malleability and ductility. 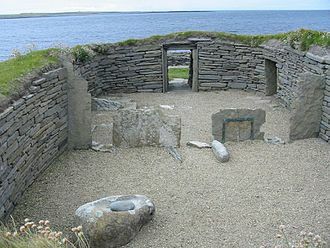 The earliest tools were stone, bone and sinew, at some unknown point the connection between heat and the liberation of metals from rock became clear, rocks rich in copper and lead came into demand. These ores were mined wherever they were recognized, remnants of such ancient mines have been found all over Southwestern Asia. 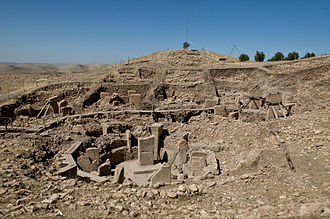 Archaeology, or archeology, is the study of human activity through the recovery and analysis of material culture. The archaeological record consists of artifacts, biofacts or ecofacts, Archaeology can be considered both a social science and a branch of the humanities. In North America, archaeology is considered a sub-field of anthropology, archaeologists study human prehistory and history, from the development of the first stone tools at Lomekwi in East Africa 3.3 million years ago up until recent decades. 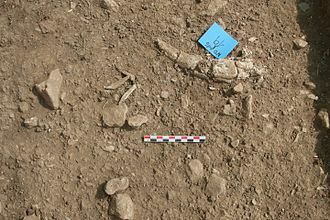 Archaeology as a field is distinct from the discipline of palaeontology, Archaeology is particularly important for learning about prehistoric societies, for whom there may be no written records to study. 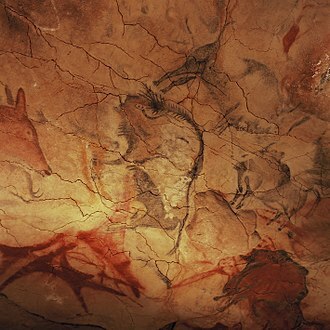 Prehistory includes over 99% of the human past, from the Paleolithic until the advent of literacy in societies across the world, Archaeology has various goals, which range from understanding culture history to reconstructing past lifeways to documenting and explaining changes in human societies through time. 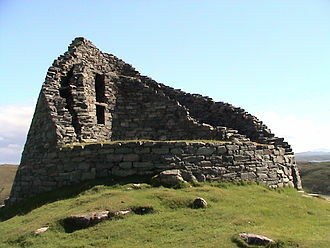 The discipline involves surveying and eventually analysis of data collected to learn more about the past, in broad scope, archaeology relies on cross-disciplinary research. Archaeology developed out of antiquarianism in Europe during the 19th century, Archaeology has been used by nation-states to create particular visions of the past. Nonetheless, archaeologists face many problems, such as dealing with pseudoarchaeology, the looting of artifacts, a lack of public interest, the science of archaeology grew out of the older multi-disciplinary study known as antiquarianism. Antiquarians studied history with attention to ancient artifacts and manuscripts. 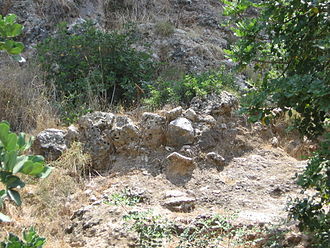 Tentative steps towards the systematization of archaeology as a science took place during the Enlightenment era in Europe in the 17th and 18th centuries, in Europe, philosophical interest in the remains of Greco-Roman civilization and the rediscovery of classical culture began in the late Middle Age. Antiquarians, including John Leland and William Camden, conducted surveys of the English countryside, one of the first sites to undergo archaeological excavation was Stonehenge and other megalithic monuments in England. John Aubrey was a pioneer archaeologist who recorded numerous megalithic and other monuments in southern England. He was ahead of his time in the analysis of his findings and he attempted to chart the chronological stylistic evolution of handwriting, medieval architecture and shield-shapes. Excavations were carried out in the ancient towns of Pompeii and Herculaneum and these excavations began in 1748 in Pompeii, while in Herculaneum they began in 1738. 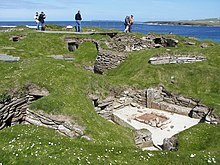 The discovery of entire towns, complete with utensils and even human shapes, prior to the development of modern techniques, excavations tended to be haphazard, the importance of concepts such as stratification and context were overlooked. The father of archaeological excavation was William Cunnington and he undertook excavations in Wiltshire from around 1798, funded by Sir Richard Colt Hoare. 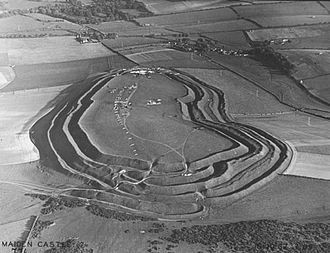 Cunnington made meticulous recordings of neolithic and Bronze Age barrows, one of the major achievements of 19th century archaeology was the development of stratigraphy. 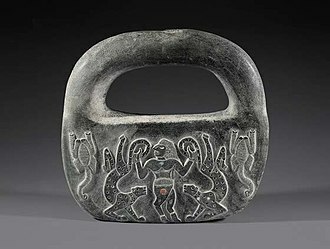 The Iron Age is an archaeological era, referring to a period of time in the prehistory and protohistory of the Old World when the dominant toolmaking material was iron. It is commonly preceded by the Bronze Age in Europe and Asia with exceptions, meteoric iron has been used by humans since at least 3200 BC. Ancient iron production did not become widespread until the ability to smelt ore, remove impurities. The start of the Iron Age proper is considered by many to fall between around 1200 BC and 600 BC, depending on the region, the earliest known iron artifacts are nine small beads dated to 3200 BC, which were found in burials at Gerzeh, Lower Egypt. They have been identified as meteoric iron shaped by careful hammering, meteoric iron, a characteristic iron–nickel alloy, was used by various ancient peoples thousands of years before the Iron Age. Such iron, being in its metallic state, required no smelting of ores. Smelted iron appears sporadically in the record from the middle Bronze Age. While terrestrial iron is abundant, its high melting point of 1,538 °C placed it out of reach of common use until the end of the second millennium BC. Tins low melting point of 231, recent archaeological remains of iron working in the Ganges Valley in India have been tentatively dated to 1800 BC. By the Middle Bronze Age, increasing numbers of smelted iron objects appeared in the Middle East, Southeast Asia, African sites are turning up dates as early as 1200 BC. Modern archaeological evidence identifies the start of iron production in around 1200 BC. Between 1200 BC and 1000 BC, diffusion in the understanding of iron metallurgy and use of objects was fast. As evidence, many bronze implements were recycled into weapons during this time, more widespread use of iron led to improved steel-making technology at lower cost. Thus, even when tin became available again, iron was cheaper and lighter, and forged iron implements superseded cast bronze tools permanently. Increasingly, the Iron Age in Europe is being seen as a part of the Bronze Age collapse in the ancient Near East, in ancient India, ancient Iran, and ancient Greece. 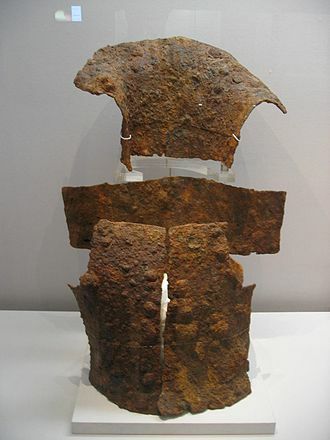 In other regions of Europe, the Iron Age began in the 8th century BC in Central Europe, the Near Eastern Iron Age is divided into two subsections, Iron I and Iron II. Gozo is an island of the Maltese archipelago in the Mediterranean Sea. The island is part of Malta, after the island of Malta itself, it is the second-largest island in the archipelago. Compared to its neighbour, Gozo is more rural and known for its scenic hills. The island of Gozo has long associated with Ogygia, the island home of the nymph Calypso in Homers Odyssey. In that story, possessed of supernatural powers. As of March 2015, the island has a population of around 37,342 and it is rich in historic locations such as the Ġgantija temples, along with the other Megalithic Temples of Malta, are among the worlds oldest free-standing structures. The island is rural in character and, compared to the main island Malta and it was known for the Azure Window, a natural limestone arch that was a remarkable geological feature, until its collapse in 2017. The island has other notable features, including the Inland Sea. There are many beaches on the island, as well as seaside resorts that are popular with locals and tourists, the most popular being Marsalforn and Xlendi. Gozo is considered one of the top diving destinations in the Mediterranean, Gozo has been inhabited since 5000 BC, when farmers from nearby Sicily crossed the sea to the island. They are thought to have first lived in caves on the outskirts of what is now known as San Lawrenz, the temples name is Maltese for belonging to the giants, because legend in Maltese and Gozitan folklore says the temples were built by giants. 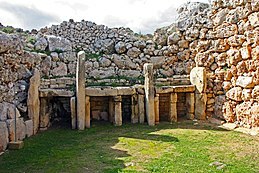 Another important Maltese archaeological site in Gozo, which dates back to the period, is the Xagħra Stone Circle. Also, native tradition and certain ancient Greek historians maintain that Gozo is the island Homer described as Ogygia, the island of Gozo was repopulated between 1565 and 1580 by people from mainland Malta, undertaken by the Knights of Malta. The law authorised the Council to raise taxes, although it never made use of this power. In 1971 the Malta Labour Party was voted into office, in the Gozo Civic Council referendum,1973, the overwhelming majority of voters voted for the abolition of the Gozo Civic Council. Homo sapiens is the binomial nomenclature for the only extant human species. Homo is the genus, which includes Neanderthals and many other extinct species of hominid. Modern humans are the subspecies Homo sapiens sapiens, which differentiates them from what has been argued to be their direct ancestor, the binomial name Homo sapiens was coined by Carl Linnaeus. The Latin noun homō means man, human being, subspecies of H. sapiens include Homo sapiens idaltu and the only extant subspecies, Homo sapiens sapiens. Some sources show Neanderthals as a subspecies, the discovered specimens of the Homo rhodesiensis species have been classified by some as a subspecies, but these last two subspecies classifications are not widely accepted by scientists. Traditionally, there are two competing views in paleoanthropology about the origin of H. sapiens, the recent African origin, since 2010, genetic research has led to the emergence of an intermediate position, characterised by mostly recent African origin plus limited admixture with archaic humans. The recent African origin of humans is the mainstream model that describes the origin. The theory is called the Out-of-Africa model in the press, and academically the recent single-origin hypothesis, Replacement Hypothesis. The hypothesis that humans have a single origin was published in Charles Darwins Descent of Man, the concept was speculative until the 1980s, when it was corroborated by a study of present-day mitochondrial DNA, combined with evidence based on physical anthropology of archaic specimens. 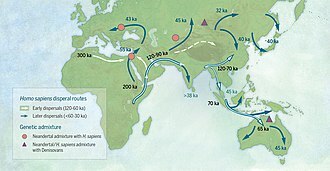 The recent single origin of humans in East Africa is the near-consensus position held within the scientific community. However, recent sequencing of the full Neanderthal genome suggests Neanderthals, the authors of the study suggest that their findings are consistent with Neanderthal admixture of up to 4% in some populations. But the study suggests that there may be other reasons why humans. That study however does not explain why only a fraction of humans have Neanderthal DNA. The multiregional origin model provides an explanation for the pattern of evolution proposed by Milford H.
Rock or stone is a natural substance, a solid aggregate of one or more minerals or mineraloids. 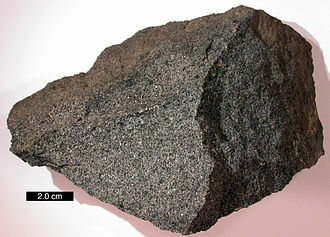 For example, granite, a rock, is a combination of the minerals quartz, feldspar. The Earths outer solid layer, the lithosphere, is made of rock, rock has been used by mankind throughout history. The minerals and metals found in rocks have been essential to human civilization, three major groups of rocks are defined, igneous and metamorphic. The scientific study of rocks is called petrology, which is a component of geology. At a granular level, rocks are composed of grains of minerals, the aggregate minerals forming the rock are held together by chemical bonds. The types and abundance of minerals in a rock are determined by the manner in which the rock was formed, many rocks contain silica, a compound of silicon and oxygen that forms 74. 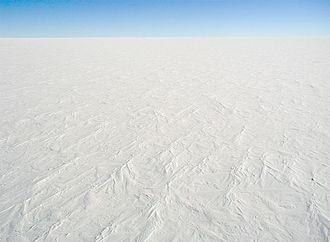 3% of the Earths crust. This material forms crystals with other compounds in the rock, the proportion of silica in rocks and minerals is a major factor in determining their name and properties. Rocks are geologically classified according to such as mineral and chemical composition, the texture of the constituent particles. These physical properties are the end result of the processes that formed the rocks, over the course of time, rocks can transform from one type into another, as described by the geological model called the rock cycle. These events produce three general classes of rock, igneous and metamorphic, the three classes of rocks are subdivided into many groups. However, there are no hard and fast boundaries between allied rocks, hence the definitions adopted in establishing rock nomenclature merely correspond to more or less arbitrary selected points in a continuously graduated series. Igneous rock forms through the cooling and solidification of magma or lava and this magma can be derived from partial melts of pre-existing rocks in either a planets mantle or crust. 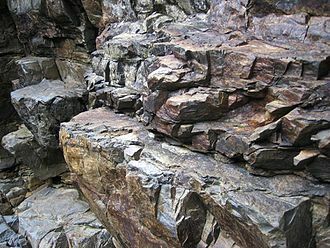 Typically, the melting of rocks is caused by one or more of three processes, an increase in temperature, a decrease in pressure, or a change in composition, igneous rocks are divided into two main categories, plutonic rock and volcanic. Paranthropus is a genus of extinct hominins. Also known as robust australopithecines, they were bipedal hominids that probably descended from the gracile australopithecine hominids 2.7 million years ago, Paranthropus skulls lack the transverse cranial crests that are present in modern gorillas. A partial cranium and mandible of Paranthropus robustus was discovered in 1938 by a schoolboy, Gert Terblanche and it was described as a new genus and species by Robert Broom of the Transvaal Museum. The site has been excavated since 1993 by Francis Thackeray of the Transvaal Museum, a date of at least 1.95 million years has been obtained for Kromdraai B. Paranthropus boisei was discovered by Mary Leakey on July 17,1959, Mary was working alone, as Louis Leakey was ill in camp. 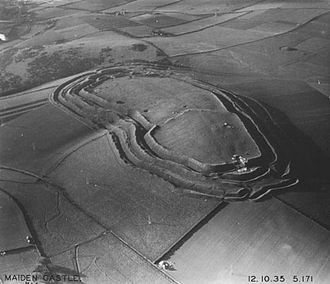 She rushed back to camp and, at the news, Louis made a remarkable recovery and they refrained from excavating until Des Bartlett had photographed the site. In his notes Louis recorded a first name, Titanohomo mirabilis and Mary began to call it Dear Boy. Recovery was halted on August 7, Dear Boy was found in context with Oldowan tools and animal bones. 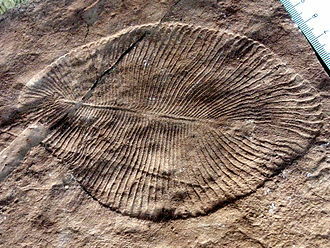 The fossil was published in Nature dated August 15,1959, in it Louis placed the fossil in Brooms Australopithecinae family, creating a new genus for it, species boisei. Zinj is an ancient Arabic word for the coast of East Africa and boisei referred to Charles Watson Boise, Louis based his classification on twenty differences from Australopithecus. Broom had died in 1951 but Dart was still living and he is said to have wept for joy on Louis behalf on being personally shown Zinj, which Louis and Mary carried around in a tin. Louis had considered Brooms Paranthropus genus, but rejected it because he believed Zinj was in the Homo ancestral stock and he relied heavily on the larger size of Zinjs canines. At that time palaeoanthropology was in a mood to lump and was preaching against splitting. Dart rescued him with the now famous joke, what would have happened if Mrs. Ples had met Dear Boy one dark night. 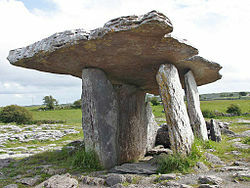 Prehistory means literally before history, from the Latin word for before, præ, and Greek ιστορία. Neighbouring civilisations were the first to follow, most other civilisations reached the end of prehistory during the Iron Age. The period when a culture is written about by others, but has not developed its own writing is known as the protohistory of the culture. By definition, there are no records from human prehistory. Clear techniques for dating were not well-developed until the 19th century and this article is concerned with human prehistory as defined here above. There are separate articles for the history of the Earth. However, for the race as a whole, prehistory ends when recorded history begins with the accounts of the ancient world around the 4th millennium BC. For example, in Egypt it is accepted that prehistory ended around 3200 BC, whereas in New Guinea the end of the prehistoric era is set much more recently. 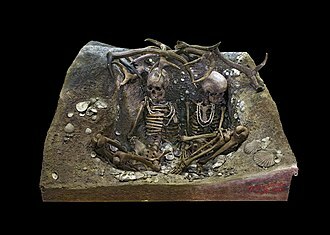 The three-age system is the periodization of prehistory into three consecutive time periods, named for their respective predominant tool-making technologies, Stone Age Bronze Age Iron Age. The notion of prehistory began to surface during the Enlightenment in the work of antiquarians who used the word primitive to describe societies that existed before written records, the first use of the word prehistory in English, occurred in the Foreign Quarterly Review in 1836. The main source for prehistory is archaeology, but some scholars are beginning to more use of evidence from the natural and social sciences. This view has been articulated by advocates of deep history, human population geneticists and historical linguists are providing valuable insight for these questions. Human prehistory differs from history not only in terms of its chronology, restricted to material processes and artifacts rather than written records, prehistory is anonymous. Because of this, reference terms that use, such as Neanderthal or Iron Age are modern labels with definitions sometimes subject to debate. 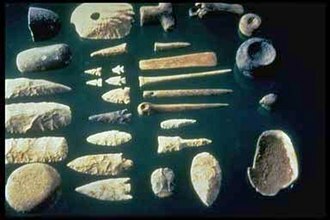 Palaeolithic means Old Stone Age, and begins with the first use of stone tools, the Paleolithic is the earliest period of the Stone Age. A spear-thrower or atlatl is a tool that uses leverage to achieve greater velocity in dart-throwing, and includes a bearing surface which allows the user to store energy during the throw. It may consist of a shaft with a cup or a spur at the end that supports, the spear-thrower is held in one hand, gripped near the end farthest from the cup. The dart is thrown by the action of the upper arm, the throwing arm together with the atlatl acts as a lever. The spear-thrower is a low-mass, fast-moving extension of the throwing arm and this extra length allows the thrower to impart force to the dart over a longer distance, thus imparting more energy and ultimately higher speeds. Common modern ball throwers use the same principle, a spear-thrower is a long-range weapon and can readily impart to a projectile speeds of over 150 km/h. In the United States the Nahuatl word atlatl is often used for revived uses of spear-throwers, the ancient Greeks and Romans used a leather thong or loop, known as an ankule or amentum, as a spear-throwing device. Spear-thrower designs may include such as thong loops to fit the fingers, the use of flexible shafts, stone balance weights. Darts resemble large arrows or thin spears and are typically from 1.2 to 2.7 m in length and 9 to 16 mm in diameter, another important improvement to the spear-throwers design was the introduction of a small weight strapped to its midsection. Some atlatlists maintain that stone weights add mass to the shaft of the device, causing resistance to acceleration when swung and resulting in a more forceful, others claim that spear-thrower weights add only stability to a cast, resulting in greater accuracy. Based on previous work done by William S. Webb, William R, the use of the device would reduce the telltale zip of a swung atlatl to a more subtle woof sound that did not travel as far and was less likely to alert prey. The woomera design is different from most other spear-throwers, in that it has a curved, hollow shape. Several Stone Age spear-throwers are decorated with carvings of animals, the British Museum has a mammoth, many pieces of decorated bone may have belonged to Bâtons de commandement. MV Ta' Pinu, one of the three ferries operated by the Gozo Channel Line, on its way from Gozo to Ċirkewwa. City Sightseeing Gozo Hop-On Hop-Off open top bus FPY 004 at Mġarr. 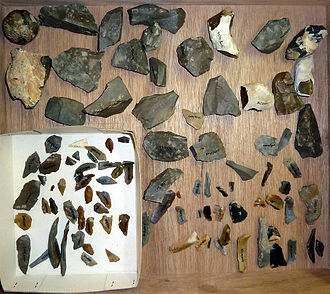 A selection of prehistoric stone tools. Axe heads found at a 2700 BC Neolithic manufacture site in Switzerland, arranged in the various stages of production from left to right. Click to see individual images. Venus of Laussel, an Upper Paleolithic (Gravettian) carving. The Venus of Brassempouy is preserved in the Musée d'Archéologie Nationale at Saint-Germain-en-Laye, near Paris. 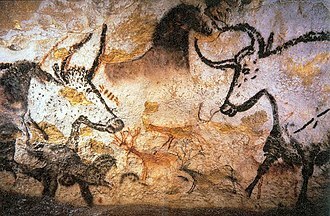 Lascaux, a UNESCO World Heritage Site. 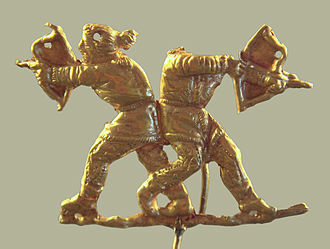 Scythians shooting with bows, Panticapeum (modern Kertch), 4th century BCE. Polychrome small-scale model of the archer XI of the west pediment of the Temple of Aphaea, c. 505–500 BCE. Frances Anne Hopkins: Shooting the Rapids (Quebec) (1879), Voyageur canoe. 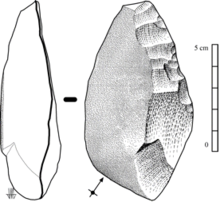 Heavy Neolithic tools of the Qaraoun culture found at Mtaileb I - Massive nosed scraper on a flake with irregular jagged edges, notches and "noses". Light grey and streaky silicious limestone. Pottery from Székely Land, Romania, on sale in Budapest. Forensic reconstruction of an adult female H. habilis by Élisabeth Daynès (2010), based on the KNM ER 1813 cranium. Forensic reconstruction of Homo habilis, , exhibit in LWL-Museum für Archäologie, Herne, Germany (2007 photograph). 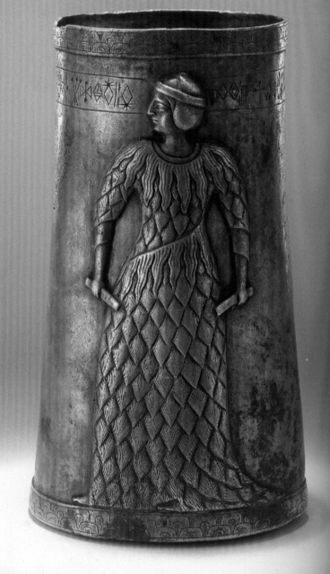 Skhul V (dated at about 80,000–120,000 years old) exhibiting a mix of archaic and modern traits. 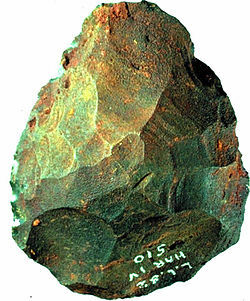 African biface (spear point) dated to the Later Stone Age. 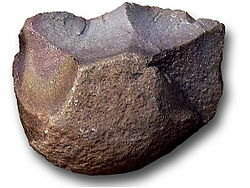 African biface (scraper/cutting tool) dated to the Later Stone Age. 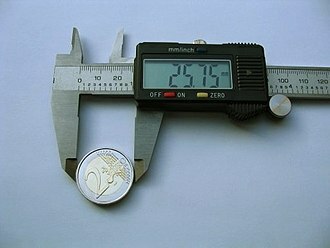 Different views of an "Azilian point" microlith from Epipaleolithic southern France (in this case), also northern Spain.